How do I find a specific check posted? Why is a student not on my attendance list? Think of deposits as a credit balance on a student account. 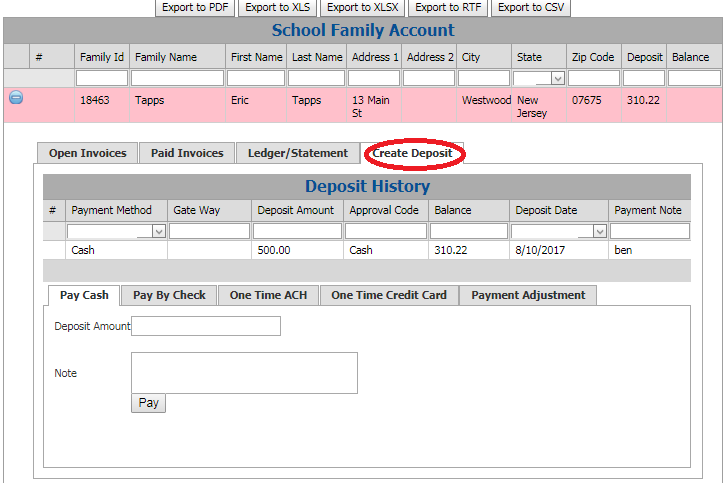 Once created, deposits can be used as form of payment on invoices. You will see a history of all deposits and it will allow you to enter a deposit. Once the deposit is created, that account will show in PINK in all Billing screens (Viewing Invoices, Creating Invoices, Create Batch Invoice, View Parent Deposit). Please complete our support form if you need assistance. © Compudance. All Rights Reserved.